Would you trust your health worker to give you accurate information on feeding your child if you knew they had been wined and dined on an international three-day trip hosted by a formula company? A trip where more time is spent being a tourist and visiting a vineyard than receiving information? This is what is happening behind the scenes since Nestlé entered the UK. Key health workers may be jetting out to Switzerland this month (October 2016) at Nestlé’s invitation. An invitation that seems to have more to do with sightseeing than anything else. Cheers! (photo: shutterstock). Nestlé is the world’s biggest formula company and the target of an international boycott because it systematically breaks marketing requirements adopted by the World Health Assembly. We have seen baby milk marketing practices in the UK become markedly more aggressive since Nestlé entered the UK market with the takeover of the SMA brand in 2012. 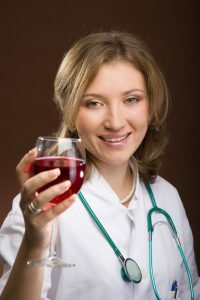 Health workers are sometimes annoyed at the suggestion that they are influenced by company sponsorship. They think they can see through attempts to persuade them to endorse a particular brand. Nestlé representatives are particularly tasked with targeting “key stakeholders and opinion leaders to support brand endorsement and strategically aligned education for Healthcare Professionals”. The main topic of the entire visit to Switzerland will be protein and the changes to Nestlé’s new SMA PRO range. Nestlé has relaunched the SMA range in the UK, recruiting a celebrity doctor and parenting bloggers to try to circumvent restrictions on advertising infant formula brands (see our UK Monitoring 2016 report). It is also trying to find ways to reach health workers to endorse its products. We are used to similar practices around the world. 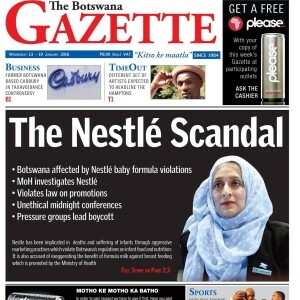 Earlier this year, Nestlé’s targeting of health workers in Botswana was exposed by the media there. All UK maternity hospitals are in the UNICEF Baby Friendly Initiative, many of them already accredited. Baby Friendly guidance does not allow company representatives into hospitals. Product information can be provided to a designated expert for assessment and only necessary information communicated on to other staff. Even this is no longer necessary, as there is independent information available on the products on the market from First Steps Nutrition Trust. Nestlé tries to bypass these restrictions by organising its own events in nearby hotels, often on topics unrelated to infant feeding. The SMA range is promoted at the events – and they usually start with food and drink. Many health facilities discourage staff from attending – which is presumably why Nestlé is trying to entice opinion leaders to Switzerland. Once you have been on a vineyard tour, how can you object to staff attending an event at a hotel? Nestlé tries other routes to target health workers. It was at the Royal College of Paediatrics and Child Health conference in April this year, promoting its SMA brand. RCPCH members voted at their AGM alongside the conference to prohibit such sponsorship and promotion in future. RCPCH Council decided to put this to a postal vote of the full membership. The result is not yet known, but will be discussed by the RCPCH Council on 27 October. This is aimed at: Nurses, Neonatal Nurses, Specialist Nurses, Dieticians, Paediatricians, Midwives, Community Midwives, Healthcare Assistants and Health Visitors. The event is free and says an application has been made for Continuing Professional Development points to be assigned to it, making it attractive to health workers and policy makers short of funding. Nestlé has deep pockets for events like this because they are funded from formula sales. They are an investment in boosting those sales. It is the “strategically aligned education for Health Workers” described in the job description. The programme for the trip to Switzerland (19 – 21 October 2016) shows just how much Nestlé invests in building these relationships. The programme on the first day is just dinner. The middle day involves 2 hours 45 minutes for presentations and a site visit, followed by a free afternoon and an evening trip to a vineyard for dinner. The third day has 2 hours 30 minutes for presentations and an Nestlé exhibition tour – followed by lunch. All of the above is paid for by parents who buy formula. If this and other Resolutions on conflicts of interest were respected then parents could have more confidence they are receiving independent advice from their health workers. And parents who do use formula would find it cheaper. No promotion – cheaper formula.